What do Caltech and Tony Soprano’s swimming pool have in common? Ducks. 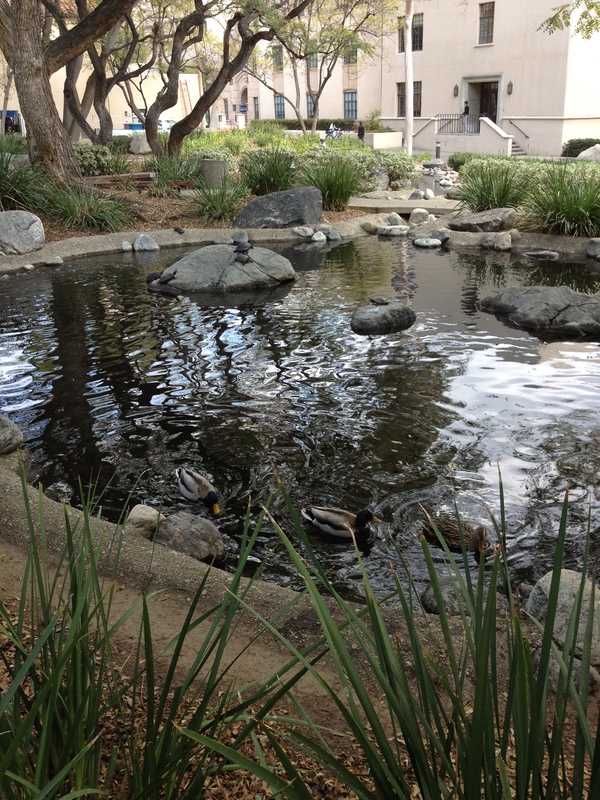 In the middle of the Caltech campus is a shady oasis for people and some unexpected wildlife. 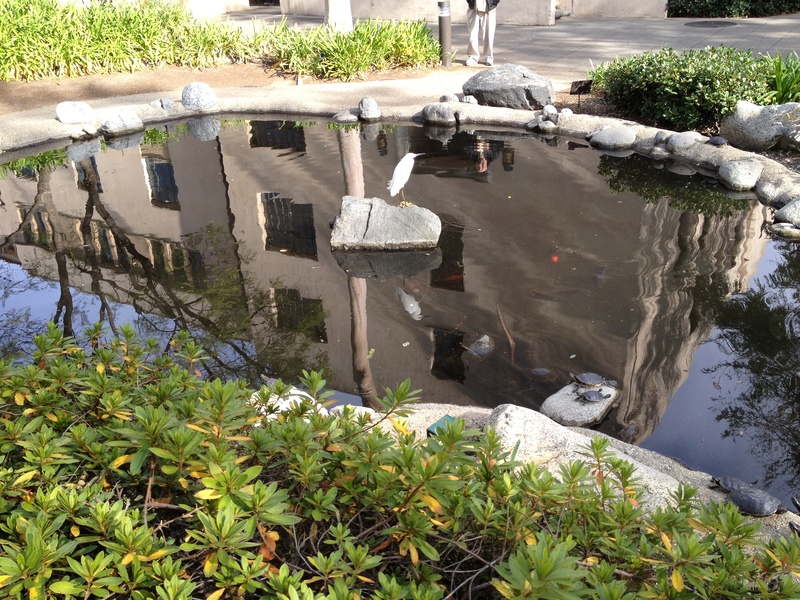 Here, deep in suburban Pasadena, California, there is a small Japanese garden with a pond full of turtles and crayfish, a few ducks – and the occasional heron. Geese cause trouble nearby. The flow of the pond’s water creates intricate zig-zagging reflections, so it might be hard to find the ducks at first. There are two males with green stripes, and one female, in the foreground of the photo below. Also note a few turtles on the rocks in the middle of the pond; most of the turtles prefer the other side of the pond – not enough sun here. I am lucky enough to work near this campus and often walk there for lunch. Any day becomes cheerier if I go past the pond and see a duck snoozing with a beak tucked under a wing. The ducks have been around for years. Lately, in a nearby reflecting pool, some geese have sporadically appeared. The geese leave poop all over the walkways, and chase people. I’ve yet to get close enough to the geese to photograph them. Goose drama. I don’t need it. In the back of the photo, do you see those stairs? One day I spied a duck waddling around, behind the stairs. WTF, is that duck going into the building? I detoured to investigate and found the duck munching from a bowl of cat food placed behind the stairs. So – the primary reason the ducks stick around may involve Friskies. Okay, maybe it’s not a heron. Egret? Anyway, it’s a large white bird that menaces the crayfish. Campus folklore has it that the pond was first populated with crayfish and turtles (and frogs; alas, the frogs have vanished) when scientists completed experiments and released survivors into the water. Unlikely, but a fine story! Across the pond, beyond the heron, is a sign that says don’t feed the wildlife. If you stand near the sign, turtles will flock to you in anticipation of being fed. Those Caltech-ians are a rebellious breed! The WP Weekly Photo Challenge wanted to see Zigzag.